My third time posting facts in this thread, but since it's active and I'm bored I might as well. Also, I love reading everyone's facts. It's so unusual when you've never met someone but also know a bunch of random stuff about them. 1. I love music, and my main goal in life is to hear as much as I possibly can before I die. I listen to about 7-12 new albums every week, which is a really fun habit and introduces me to so much stuff. 2. Politically, I consider myself a democratic/revisionary socialist, having gone from more hard-left beliefs towards the centre ground. I'm a member of the UK Labour party. 3. An album's cover image is a huge factor in whether I will listen to it/buy it. I know it sounds shallow, but I figure that since I see albums as a complete work of art, then the cover is part of that. 4. I'm bisexual, and am in the process of coming out to my close friends. Hopefully I will be able to attend a pride event soon. 5. I don't read nearly as much as I'd like to, but have a love for Jane Austen that started when I read Pride and Prejudice for my GCSE English. 6. If I become a musician, I would like to model myself on Björk or David Bowie in terms of image and versatility, but I don't think I have a bold enough personality. 7. Although I know the stars and planets probably don't affect me, I really enjoy astrology and looking at my daily horoscope. 8. My favourite song at the moment is Teenager by Camera Obscura. 9. My favourite movie is Ferris Bueller's Day Off. 3.My only crush in real life was in junior middle school.The boy was quite good-looking and had a close friendship with me,but I was never special to him.I remember watching him shyly from a distance—now I think I was being silly. 4.My current interest is basically classic rock music.I am eager to dig into those oldies but goldies,but sometimes I'm so lazy that I just stick to the Beatles. 6.I can play piano,and I hope I can learn to play guitar soon. 7.I have never had a pet.Though I have much affection for small animals,I'm never good at taking care of other creatures and my parents are too busy to look after a pet. 8.I am quite a bookworm,mainly interested in literature,history and music. This must be my fifth time posting on this thread? 1. For any newcomers wondering, I'm currently 16 years old, 17 in August. 2. I'm still very much a "mocker"
(but leaning more towards mod). 3. 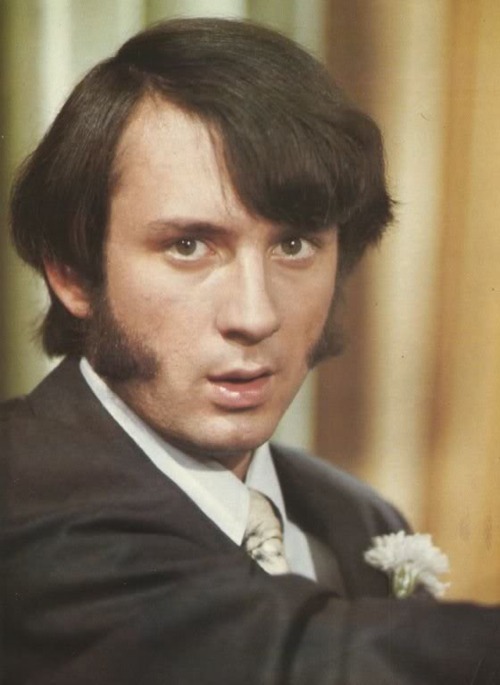 My current hairstyle is modelled on a combination of late '67/'68 Paul and my favourite Monkee Mike Nesmith, in that it's parted to the right and I have sideburns. I've tried growing a full beard, but because of puberty it was taking forever, so I'm leaving that 'til a little later to try again. 4. I ended up passing all but my science and maths GCSEs last year. Thankfully, I don't have to resit science in June, but I do have to resit maths. I don't really mind doing the latter though. 5. I'd quite like to learn how to play steel pedal guitar, as my fascination with that instrument has grown in recent months, but unfortunately there are none in my college. 6. I only recently opened an Instagram account. I can safely say most of my time on there is spent looking at Beatles/Beach Boys memes. 7. I'm slowly trying to branch out of my 60s and 70s rock/pop obsession shell by trying out a few things from new genres. The first three i have lined up are Northern Soul, experimental synthpop and early (80s/90s) hip hop. Any suggestions on particular artists or albums are welcome, just PM me. Okay, my mind has gone blank, so I can't think of two more. Hope you enjoyed those 7 though, readers! 2. I don't really have any good friends anymore, outside of the forum. 3. Like Peppy Puppy and some others, I am also 16. 4. I love video games; more specifically Nintendo stuff. I've got a Switch and a few different handhelds. 5. I want to be a musician, perhaps in a band, but I really don't know anyone outside of the forum that plays anything. 6. I'm considering getting a job soon, perhaps at a music store. 7. I really want to move to Europe when I'm older, but nobody else seems to support this decision. 9. I still want to play through the Mother series, but I still need to figure out the best way to do it. It's complicated. Aww WeepyC that's not good! Thanks, @The Hole Got Fixed and @Beatlebug. I appreciate it. Luckily, I always have the forum and plenty of friends here! 1. I gave up trying to please others last year. If they don't like me for who I am they can feck off. 3. I hate plain shirts. 5. I have no brothers, sisters, or first cousins. Apparently I have second cousins but I've never met them and can't remember their names. I agree with you 100% on #1 and am the exact opposite on #3. Update Part Three, so I can join the trend. I’m doing an update. Because it’s been a while, right? Good list. 1, 2, 4, 7 and 9 connect with me especially. Do you like it? My brother can be annoying but I don't know what I'd do without him. I do like having the ability to have me time whenever I want - though I don't know if it is a factor to my introvertness or it helps manage it.
. I also understand Tamil, since it's my mother tongue, and I'm trying to learn Spanish. 3. My grandmother is an Indian classical musician, but unfortunately I have inherited close to none of her musical talent. I've been learning piano for 7 years, and I play about as well as my 8 year old neighbor. It isn't bad, it's just not great. 4. I do get some of my art skills from my grandfather. I grew up thinking he used to be a professional artist, but he was, in fact, a Taxman . 6. I'm about as straight as my hair is. My parents don't know, but I haven't really felt the need to tell them yet. 7. I've been a Beatles fan for a couple of years now, but I've only been a Beatlemaniac since November 28th, 2018. Since then, 80% of the music I listen to has been Beatles or solo Beatles. I'm trying to listen to 2 or 3 new albums (by other artists) every week. 8. I have to dissect a pig's heart in biology next week. 9. My family adopted a dog last year. She's deaf, so she needs some extra care, but she's super adorable! Tried the site, and I'm 520,030,288 seconds old. You've surely got a great family! "I'm as free as my hair–"
It's wonderful to try new things! I study arts and don't need to face dissections, or my stomach might turn. oh my gosh yes. That doesn't happen to me very often, but when it does, it's WEIRD. There are so many of us on this forum, wow! Will you miss High School or will you be glad to see the back of it?